Oh look, there’s…uhhh…what’s her name? Welcome back. Do you do better at remembering names or remembering faces, or are you equally good or bad at both? Most people think they’re better with faces than names, but that’s not what a study found. 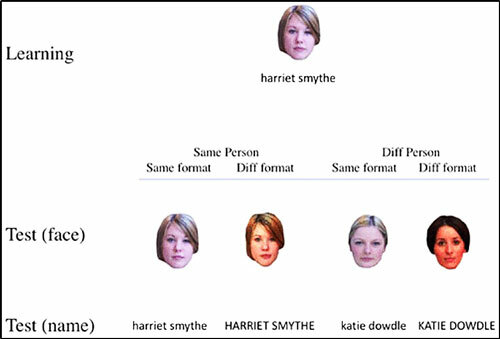 Collaborators from the UK’s York and Strathclyde universities conducted three experiments to compare memory for faces and names. Here are the details if you’re interested, or you can just jump to the wrap up. A self-paced learning phase had 24 participants (19 female, 5 male, average age 21) memorize the face and name of 40 unfamiliar individuals (half male, half female), viewing same-size, color photos of the faces, displayed with their names on a laptop computer. The photos had been taken with the same camera and settings; the names were written in lower case. The participants were then tested, first on their memory of the faces. The 40 faces from the learning phase were shown, but 20 of the photos were taken with a different camera. In addition, photos of 40 other faces were also shown, 20 taken with the camera used for the learning phase photos and 20 taken with a different camera. The 80 photos were shown in random order. The name recognition test was similar to the face recognition test. The 40 names from the learning phase were shown, 20 written in the same case (lower) and 20 in a different case (upper); and 40 other names were also shown, half lower case, half upper case. Example of a learning item and test items for each condition of Experiment 1 (from journals.sagepub.com/doi/10.1177/1747021818813081). The participants accurately identified an average of 73% of the faces shown in the same photos from the learning phase and 64% of the faces shown in different photos. For names, the average accuracies were 85% and 83% for the same and different cases, respectively. The second experiment repeated the first experiment with 24 different participants (21 female, 3 male, average age 21) and a learning phase that presented the faces and names separately. The participants accurately identified an average of 76% of the faces shown in the same photos from the learning phase and 67% of the faces shown in different photos. For names, the average accuracies were 89% and 86% for the same and different cases, respectively. 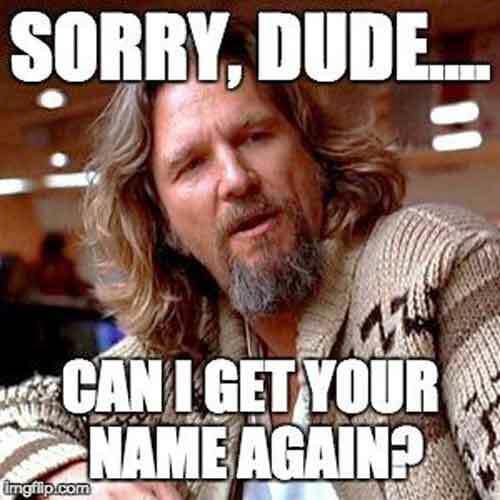 Given that recognition memory has been shown to be worse for unfamiliar faces than for familiar faces, the researchers added the final experiment to get a measure of memory for faces and names of familiar identities. They followed the same learning and test procedures with 21 participants (17 female, 4 male, average age 22) and same-size, color photos of celebrities paired with their names. After adjusting for celebrities that were unfamiliar to the participants, the resulting average identification rates were 88% of faces shown in the same photos from the learning phase, 85% of faces shown in different photos, and 89% and 90% of the names written in the same and different cases, respectively. Of course, name tags would help. The study found a clear advantage for remembering names over faces of unfamiliar people, yet that advantage disappeared with familiar people. Why the contrast? 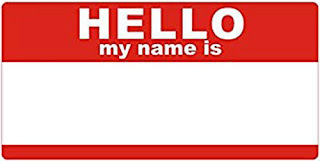 The researchers offer that the absence of non-visual information, such as names of unfamiliar faces, seems to reduce recognition memory. And that’s one reason why retrieving people’s names is difficult. It’s not a categorical change in stimuli from faces to names; it’s a categorical change in memory tasks from recognition to recall.